Does your horse have healthy feet? Using this photo as an example, compare yours horses feet next time the farrier is there. This foot is two equal halves either side of a centre line (balanced). The sole is concave, (the sole can descend under load without causing sole pressure and pain). The white line is white, not stretched, red (bruised), black (necrotic) or laminitic. The foot is in the process of being prepared for a shoe which, when fitted, will cover the heels and extend back to the widest part of the frog. Are your horses shoes long enough?? There is no bruising in the space between the heels and bars or along the laminae of the bars which have been trimmed level to the sole. Overall this is a very healthy foot. Compared with this foot which has a serious area of bruising between the outside heel and along the bar, (a corn). The heels are contracted. This indicates decreased heel function and potential circulation problems. This syndrome is known to be associated with navicular disease. This horse’s problems were contributed to by shoes fitted too short, combined with wedges. This resulted in further collapse of already long low heels and bruising. When re-shod with balanced feet and shoes 1 size larger the horse was improved immediately. 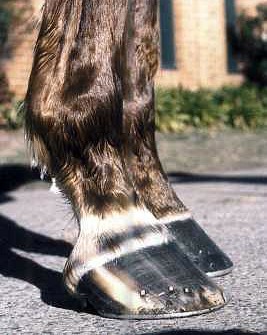 The horse has a broken back hoof-pastern angle, this leads to increased pressure up the front of the leg and increased stretch or strain to the tendons at the back of the leg, in other words it contributes to osteoarthritis, shin soreness, carpal bone and fetlock joint problems and bowed tendons. These feet are well overdue for shoeing and the shoes look untidy. This probably means they are loose. This horse already had a carpal bone chip fracture when this photo was taken. The hoof- pastern angle is normal. The nails are in the front half of the foot and are about a quarter to a third of the way up the wall at the point of exit. The shoes extend far enough back to provide a platform for the heels to expand on under load and allow for growth of the foot over time which will pull the shoe forward. The clip is the same angle as the wall and was seated into the wall and not tapped back. Breakdown caused by bad shoeing is the single most easily preventable cause of failure to race or achieve maximum potential. There is a correct shoe for each phase of training. Steel shoes are used in pre-training following the theory of the lighter the shoe the better. Light steel plates and training plates are used when fast work begins and do not add much length to the hoof wall and therefore make it easier for the toe to break over during each stride. Correct length of toe is important as it relates to the amount of work required by muscles and the tension of tendons to get the toe off the ground. Therefore, imbalanced or overlong feet contribute to fatigue and breakdown. 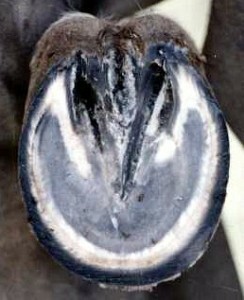 Race horses should be frequently shod (3 – 5 weekly). A longer interval than this before reshoeing will lead to imbalance of the feet and contributes to long toe – low heels and racing injuries such as bowed tendons and joint problems. However, clips and nail holes damage the hoof wall with insufficient wall growth before reshoeing if care is not taken to minimise damage to the hoof wall. 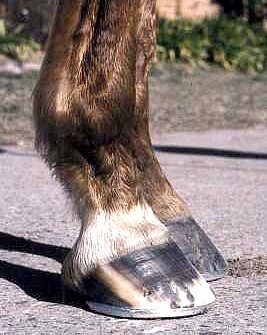 Pitching nails too high or behind the widest part of the foot restricts hoof function (expansion), but nails need to be driven high enough to be reused if possible. If a shoe is lost out of a strong area of hoof, the nail is pulled cleanly through. Clips can be set onto either side of the toe as paired side clips or singly, in rotation, to help prevent seedy toe. 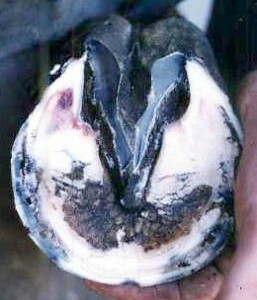 Tapping the clip back onto the wall should be avoided as this crushes the cells which produce the white line which grows off the end of the distal laminae (the distal edge of P3) and results in bruising tissue death, bone resorption, pedal osteitis and eventually seedy toe and hoof cracks. Racehorses often suffer post race soreness/trauma to the feet. A combination of lactic acid build up from exercise, inflammatory response and digestive disturbance from a high grain diet and over confinement places many horses on the verge of laminitis. A symptom is bruising of the white line which is very common. Farriery error such as cutting feet too short and sole pressure contribute to this syndrome which results in chronic low grade soreness often not noticed as lameness because it is occurring in all four feet. Spelling is supposed to give the horse a holiday but often the feet are worse when the horse returns than when it left. This is due to a rapid change in diet, exercise and environment. Horses should be let down before going to the paddock. Considering the care they receive, and money spent on them, many racehorses have very bad feet – underrun heels or contracted heels, flat feet, corns and lack of strong healthy hoof growth are common problems. HORSES BREAK DOWN FROM THE GROUND UP! The muscles of the leg have no control over the landing phase of the galloping stride; the hoof is like a pendulum on the end of a piece of string – it is thrown out and falls to the ground. Correct, balanced shoeing maximises stride potential; it does not lengthen it. Bad shoeing can shorten the stride, waste energy and cause breakdown. Galloping horses carry the whole body weight on the leading front leg. As the body is propelled forward from behind, the carpus, suspensory system and flexor tendons are under enormous strain and the front legs are most likely to break down at the weakest point or site of previous injury. Horses cannot run fast with sore feet, but I have seen many that try, failing to run on at the end of a race, lifting their heads instead of accelerating, running off at the bend, climbing or running slower than expected and pulling up distressed. This conforms with the concept of V Heart rate Max (VHM) this means that maximum velocity (speed), maximum heart rate, maximum oxygen transport and uptake are all reached at the same time and the horse then cannot go faster and is about to begin burning energy in the cells anaerobicly (without oxygen) this process then accelerates the production of lactic acid which rapidly brings on fatigue and the horse’s athletic potential has been reached. Training can increase a horse’s VHM but many factors such as maximum heart rate are genetically determined traits. It is now known that lameness will lower performance by causing a horse to reach it maximum speed, heart rate and oxygen transport to the cells (VHM) earlier. Therefore, the horse will not be able to go as fast for as far despite having the same degree of fitness that it had when it was not carrying an injury or unsoundness. Never underestimate the effect of even a mildly sore foot on a horse’s performance.